Looking for an excuse to head to your local hobby shop? Randomly inserted in Series 1 hobby boxes are 2013 Topps Spring Fever redemption cards. Take them to the closest participating shop and you get a free pack of exclusive cards. The catch: they're only supposed to be valid from February 20 to 27. That said, some are still showing up early. Shop for 2013 Topps Baseball Spring Fever cards on eBay. 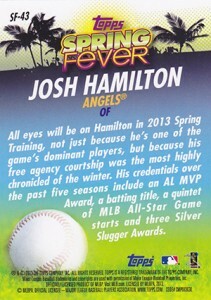 Every 2013 Topps Baseball Spring Fever pack has five cards. The foil-based design is extremely bright and colorful. The checklist has 50 cards, encompassing veterans, rookies, Hall of Famers and retired stars. 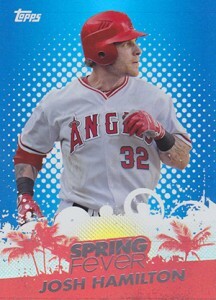 The Josh Hamilton card is his first in an Angels uniform. Randomly inserted in packs are autographed versions. The cards use sticker signatures and are numbered on the back. Numbering varies widely. Below is a full 2013 Topps Baseball Spring Fever checklist. We've also got confirmed autographs and reported print runs. We'll add to this as more information becomes available. This list shows confirmed autographs and reported print runs. We will continue to add to it as more cards pop up. I exchanged a half-dozen redemption cards for packs yesterday, and even pulled a signed A.J. Ellis card, which is nice. But… I don’t care for these cards much at all. I find them gaudy and kind of ugly. The palm trees, despite the Spring Training locations in Florida and Arizona (palm trees in Arizona, does that make sense? ), look ugly. The lack of authentic backgrounds, with goofy designs… The whole thing looks like something a High School kid would put together. Topps is a victim of their own success. The Series 1 base set and inserts (despite the fact there are WAY too many different insert possibilities) are so cool, it makes these cards look silly. i pulled a musial auto from my spring fever packs- print run is 26.
kevin � Congrats and thanks for the heads up! You can add Orlando Cepeda to the autographs list, I pulled it yesterday!! Steve Douglas � Thanks and congrats! What’s it numbered to? I dont understand the palm tree comment… There are tons in Arizona as well as Florida. As for the all around card design I agree big time! Pretty silly! Hopefully the silver redemption packs will be nice, does anyone know when they will send those out? Is there an update on the availability? I pulled a Mike Trout *Auto *36/51. Honestly, I over looked the auto… wow. Now, I have to re-check all my Spring Fevers. 2013 Topps Series 1 Baseball Hobby Box - Factory Sealed!